This was … well … unusual. Debbie Reynolds Biondi is a comic book creator and writer who achieved fame for her superhero series “Sputnik Chick Girl with No Past.” It’s been 20+ years and much of Biondi’s life is now attending conventions, signing autographs, and listening to fan after fan asking her to please tell them Sputnik Chick’s backstory, while she simply wants to find some attractive guy and get laid without having to talk about comics. But the comic world is struggling and Biondi has trouble coming up with new adventures for Sputnik Girl and finally relents to sharing her origins, which – not surprisingly – mirror Biondi’s own strange origins. Sputnik/Biondi comes from an alternate universe. But in a slightly unusual twist, Biondi herself may be more of a superhero than her crime-fighting creation, having saved the entire human race but then relegated to anonymity and losing everything she’s loved the most. The book is very interesting and author Terri Favro’s understated style carries a melancholy tone that is so appropriate to Biondi’s plight (though we don’t know that until much later in the book). But at times this melancholy appears to occur at the expense of story. Although this is quite readable and will pull the reader in, what we have – aside from a story within a story – is a book that is 90% backstory. After being introduced to Biondi, we get to learn all about her (her backstory) – first through her creation, and then her own story. It’s a fascinating way to read/tell a story. The last ten percent of the book is the culmination of Biondi’s story, but it stands out as being different enough – in story and in tone – from the rest of the book that it feels as though this was an action tale with too much back story to get to the climax. It was exciting, but it really was so different – much more of a fantasy than we’d had to that point. Though Favro tried to give us some hints (with one character in particular) we just didn’t see the magic room and space/time hopping coming. The fact that some of this feels like a story within a story within a story because Terri Favro is also a comic book writer, added just enough hint of autobiography to keep the reader guessing as to where the story would go. There was a lot to like about this book, and I really want to read this again, now that I know where it is going, to hopefully better pick up on some of the (hopefully) clues in the book. I was caught up in the story and looked forward to seeing where it would go, but at the same time, once it was over I was left feeling unsatisfied. Looking for a good book? 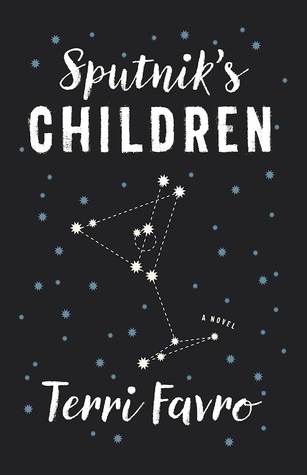 Sputnik’s Children is a fantasy novel by Terri Favro and takes a unique path to tell a complicated story, but it’s left just a little too unresolved for full satisfaction.